Materials: Chromed metal, Bakelite socket. Cast iron counterweight in the base. 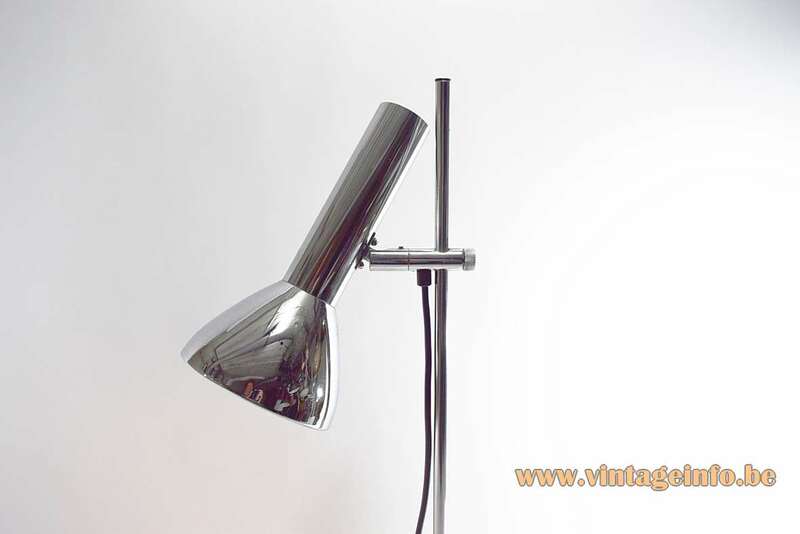 Aluminium chromed lampshade, white painted inside. 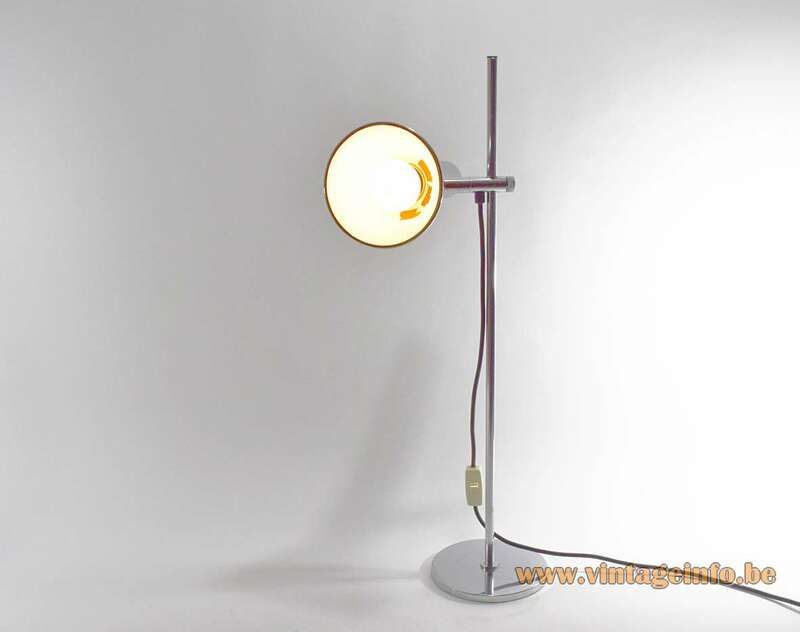 Manufacturer: Sölken-Leuchten, Arnsberg, Germany – Walter Hustadt GmbH & Co. KG Leuchten, Am Schindellehm 7-9, 59755 Arnsberg, Germany. .
Other versions: Also made as a double light floor lamp. The lampshade was used for several lamps, among which a wall lamp. 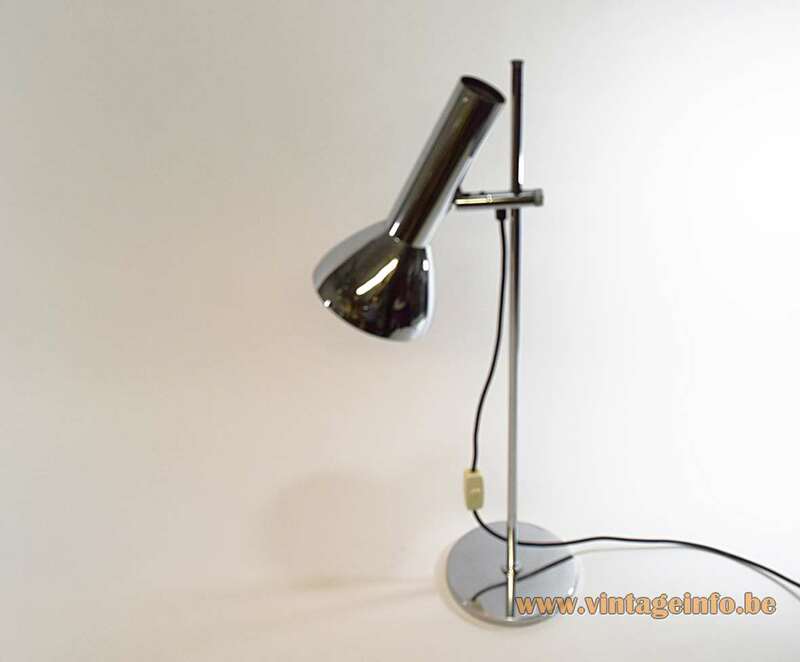 These series of lamps were also sold by Fase from Spain and Hustadt-Leuchten, also from Arnsberg, Germany. On this page a picture from a 1974-1975 catalogue. 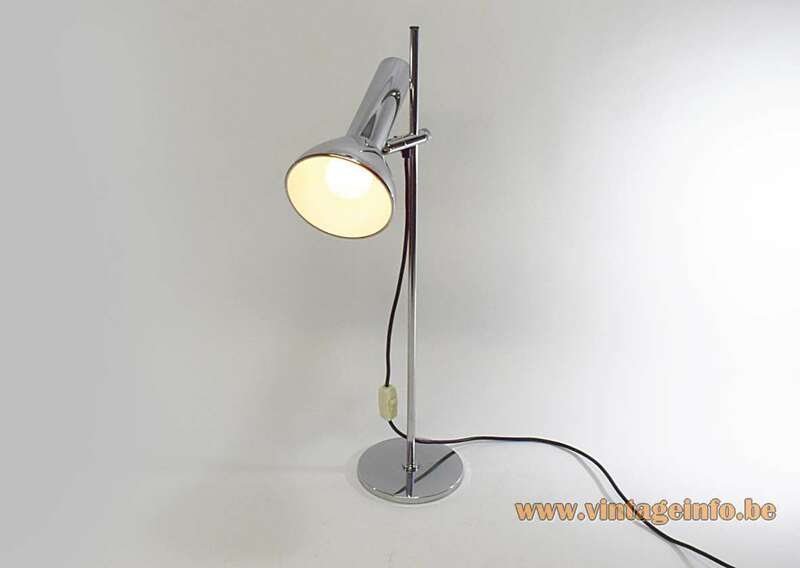 Fase sold many lamps made by other companies. More information over here. In all probability these lamps ware produced in Arnsberg, but by which company? 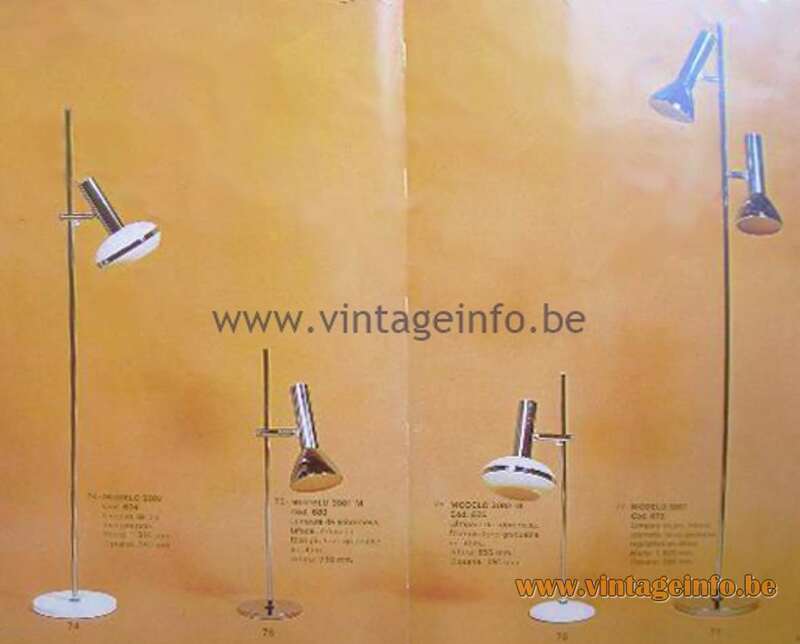 The two other lamps in the catalogue picture, the two white ones with the chrome ring, were also sold by all these companies. Also Massive from Belgium sold them. They exist in multiple colours. 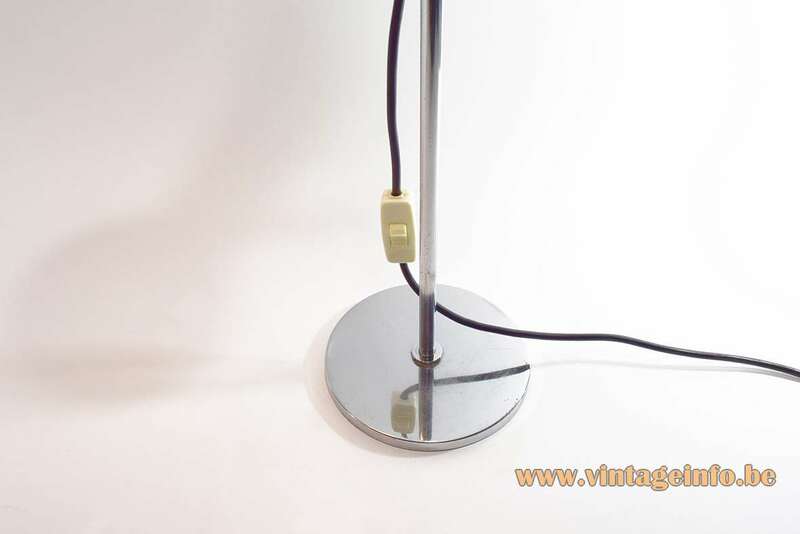 When you do a search on the internet for the OMI mark on the chromed knee joint, you always find lamps that are described as lights designed by Koch & Lowy for OMI. 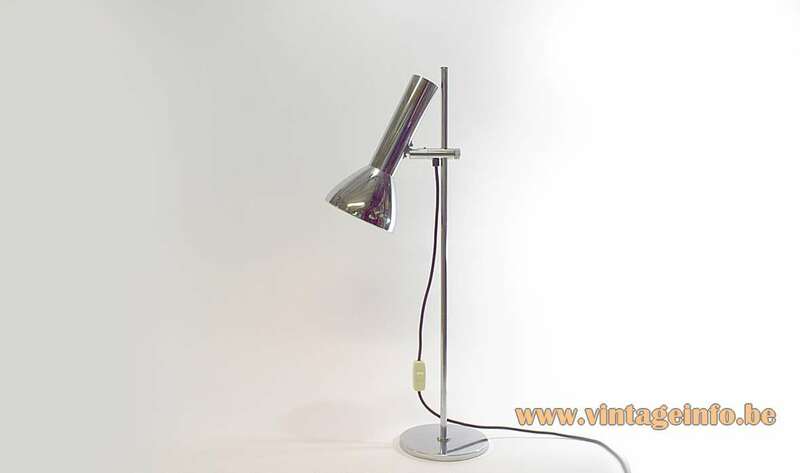 Koch & Lowy is not a design team, but an American light company and has got nothing to do with this lamp. Today Koch & Lowy is owned by Chapman Manufacturing Company, Inc. from Avon, Massachusetts. Some say OMI Switserland, but there is nothing to be found about a Swiss company with that name. Others say OMI DBGM, because sometimes it is written on the knee joint. DBGM is not some type of company, but it is German for utility model, “gebrauchsmuster” in German. Only used in Germany and Austria: Deutsches Bundes-Gebrauchsmuster. To say it simple, the knee joint is made by a company named OMI and the system is licensed for some period, most of the time 10 years: the small brother of a patent. 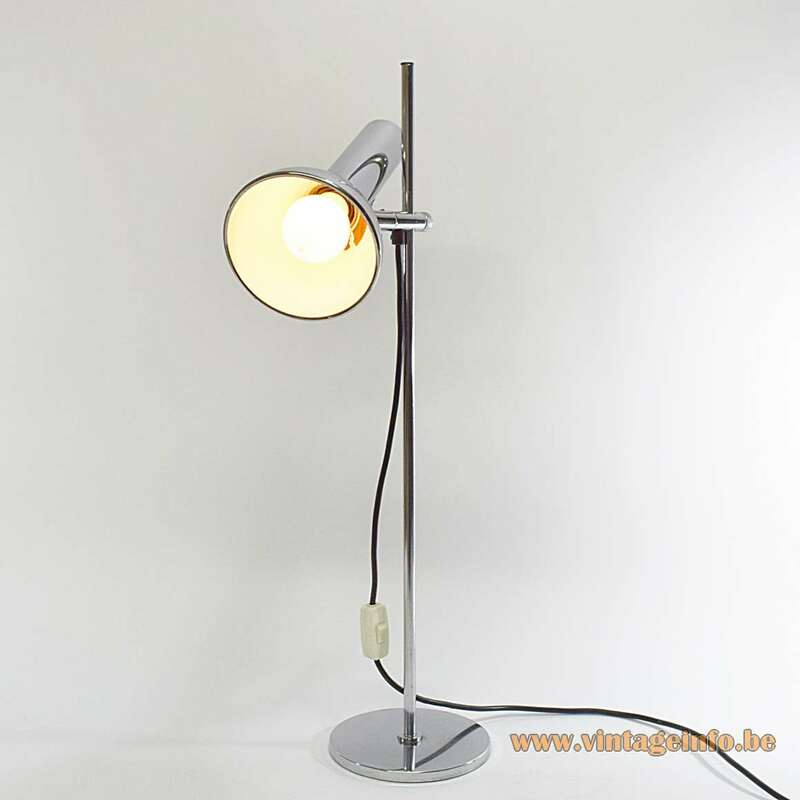 Josef Sölken GmbH & Co. KG Leuchtenfabrik was founded in january 1950 as a family business. Over the years they produced and sold many lamps. Many of them were also sold by Massive from Belgium. The company Sölken was declared bankrupt in 2001, it had been in trouble for some time. 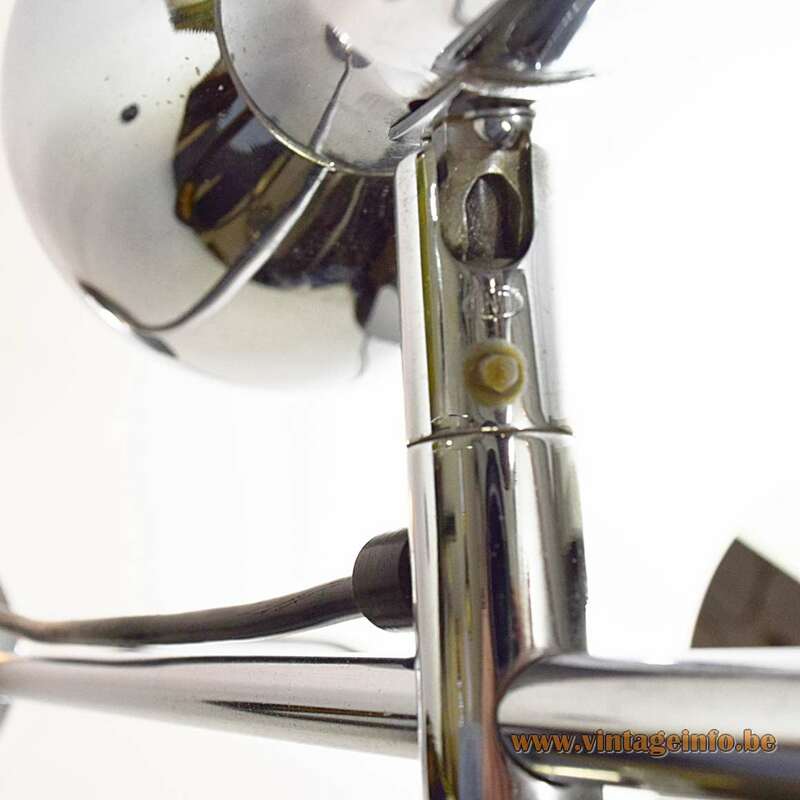 Sölken-Leuchten was a client of OMI and used OMI parts for most of their lamps with some joints in it. The Briloner lighting company owned by the Hustadt family has taken over the high-voltage system and in the low-cost Soelken systems compatible systems. 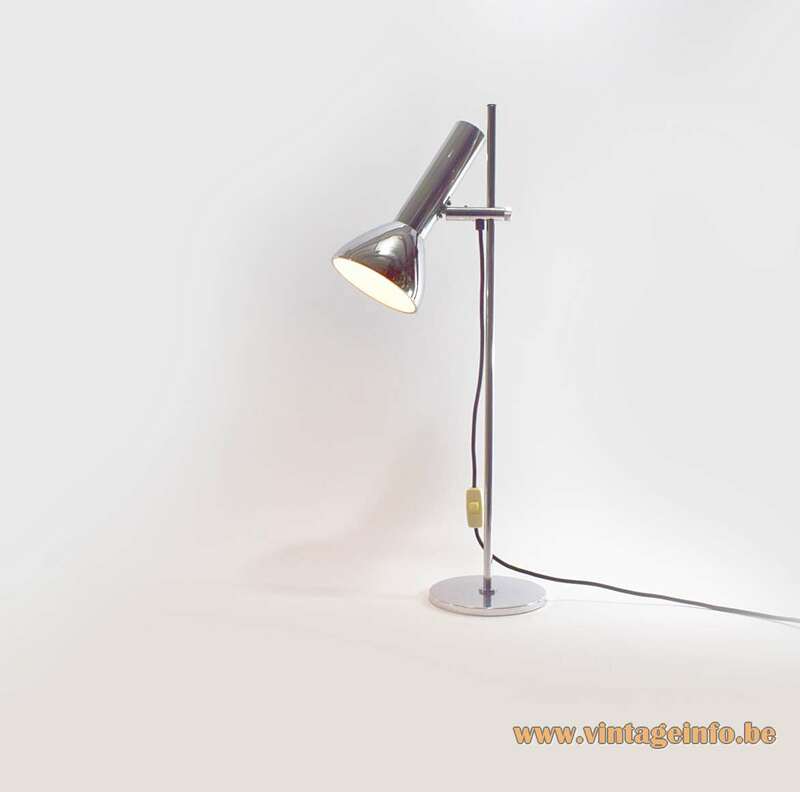 The rest of the company was acquired by S-Leuchten Verwaltungs GmbH, also from Arnsberg. Today Sölken-Leuchten is owned by Stefan Schrader from Lichtservice Schrader in Hamburg. The OMI company is Otto Meinzer GmbH & Co Metallwarenfabrik from Iserlohn in Germany (Otto Meinzer Iserlohn). It is a manufacturer of chromed brass joints for the lighting industry. The joints are marked with the OMI mark. The company was founded more than 50 years ago. They never produced lighting. The switch of this lamp has stamps that say that the switch is approved for use in Denmark, Sweden, Norway and Germany. Companies that use OMI parts are among others: Atelje Lyktan Sweden, Massive Belgium, Fase, Hustadt Leuchten, Abo Randers Denmark and many more.